In medium bowl, stir milk and pudding mix with whisk 2 minutes. Stir in pumpkin and pumpkin pie spice. Refrigerate until ready to assemble parfaits. In another medium bowl, beat cream cheese and powdered sugar with electric mixer on low speed until blended and smooth. In chilled large bowl, beat whipping cream on high speed until stiff peaks form. Fold whipped cream into cream cheese mixture. 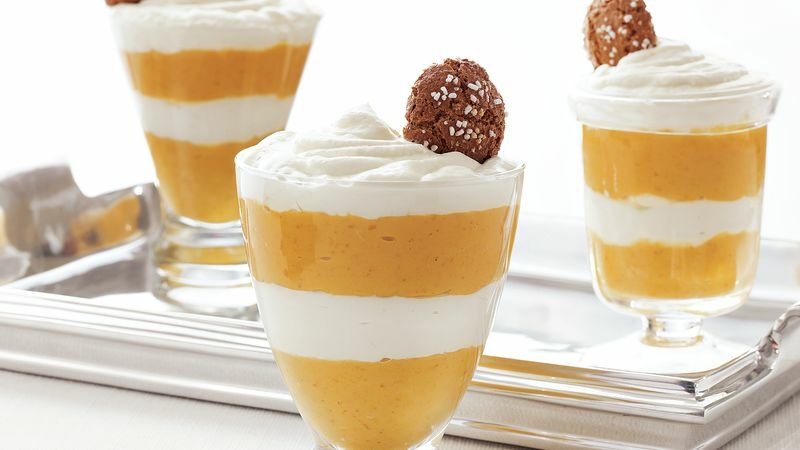 In each of 6 parfait glasses, spoon 1/4 cup pumpkin pudding; top each with 6 tablespoons cream cheese mousse mixture. Repeat layers. Refrigerate 2 hours or until serving time. Just before serving, top each parfait with a cookie.